A sportsmans perfect pen. 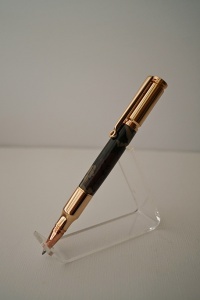 This simulated 30 caliber bullet pen offers a smooth writing parker refill, rifle scope clip, and beautiful gold plating. Perfect size and wieght for the hand, will permit many hours of comfortable writing.